The deadlift shares the spotlight with the squat as King of Exercises. The popularity of Crossfit has introduced the deadlift to many new people, which is excellent. Unfortunately, many people deadlift incorrectly and run the risk of developing lower back pain as a result. This article will focus on locking out the deadlift properly. I’ll explain correct form, highlight examples of incorrect form, and provide coaching cues to fix your lockout. In Part 2, I’ll feature exercises, drills, and techniques to cement your new and improved lockout. Lock out the deadlift with your hips, not your lower back. Squeeze the glutes hard once the bar passes your knees. Think about pulling your hips UP (hip extension), not shoving them forward (lumbar hyperextension). If you feel deadlifts in your lower back more than your legs, you’re most likely doing it wrong. Deadlifts are an isometric exercise for the lumbar erectors. The range of motion for the lower back on a correctly executed deadlift is zero. Focus on strengthening your glutes to fix your lockout. Perform low-level activation exercises daily, add correctly-performed posterior chain exercises as accessory lifts, and practice correct deadlifting form with lighter weights to rebuild your technique. Build up your core strength (anti-extension focus) to improve your lockout and resist hyperextending your spine during lockout. If you struggle to lockout properly, you probably have poor posture in your lower back (lordosis). Re-master easy core exercises with your corrected posture before moving back to advanced exercises like rollouts. Looks OK at first, right? Nope! The problem is his lockout: he’s using his lower back to finish instead of his glutes.. When I began coaching professionally, I began working in a local “big box gym” that also had a popular Crossfit program. I quickly developed a niche in the “traditional” part of the gym as the “post-rehab guy”. If you need to train around an injury or transition back to lifting after physical therapy, I’m your man. A large part of what I do is simple injury prevention: creating “structural balance” by improving posture, core stability, and balancing strength through the body. I coach mostly healthy clients and athletes, but with a focus on proper form and “qualifying” people for exercises. Both at that gym and in the years since, I’ve worked with plenty of clients with stubborn back pain and poor deadlift form. In each case, they locked the deadlift out with their lower back muscles instead of their glutes. The worst cases were unable to use their glutes even on bodyweight exercises. Now, this doesn’t mean you’re weak. And your spine won’t snap in half and shoot across the room when you do this. Plenty of people get strong doing this. It’s just not ideal and can lead to poor performance and overuse injuries down the line. It’s very common and is often the result of bad (we’ll say well-intentioned yet misinformed) coaching. 1 – They were often weaker than they should be. Not being able to use their glutes severely limited their strength and left pounds off the bar. They should have been able to deadlift more than they could. 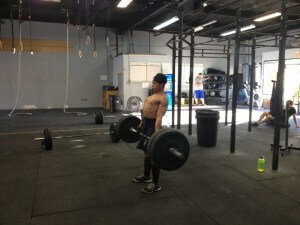 As a result of learning correct form, each client set new personal records on their deadlift. 2 – They often had lower back pain or hamstring injuries caused by muscle imbalances. 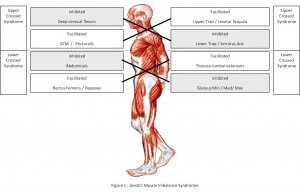 This is a classic example of Janda’s Lower Crossed syndrome, as referenced in the diagram below. 3 – They struggled with several other exercises, to include: overhead pressing, squatting, lunging, and running. 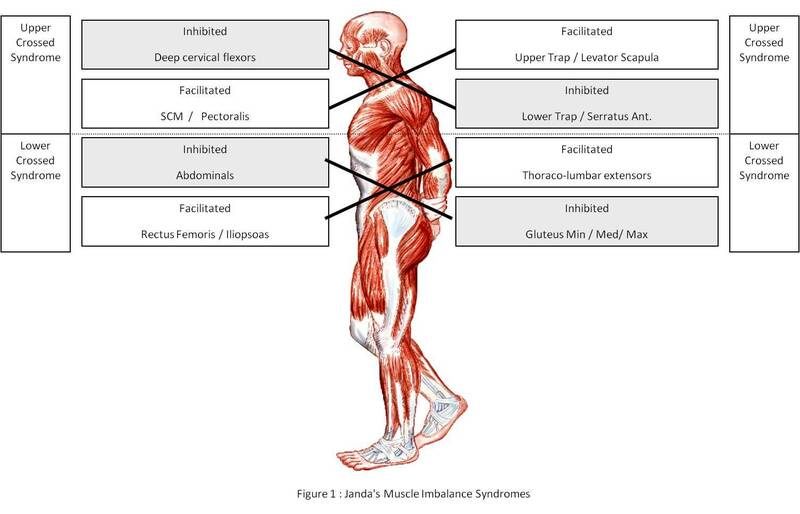 Their muscle imbalances made them inefficient, stiff, and seemingly inflexible. Many of the clients I’ve worked with have reduced or eliminated achy lower back pain simply by learning the correct form for the deadlift. This usually involves teaching them how to lockout correctly by using the glutes instead of the lower back. Combined with exercises to strengthen their glutes and abs, they usually saw increased strength and performance while they moved and felt much better. Simply put: don’t drag the bar up your legs and then shove your hips forward to finish. You need to explode with your glutes once the bar passes your knees. Pull the hips up, don’t push forward. Wolverine doesn’t lean back when he locks out his deadlifts. Neither should you. Look at 0:11. The chest is out – too far out. Ribs are up, the lower back is hyperextended, and the shoulders are behind the hips. It’s a subtle lean back, but this is what you’re looking for in a lousy lockout. Here’s Lee Boyce again, demonstrating a well-executed Deadstop Deadlift. Check out 0:08, he’s locked out perfectly. He’s standing up straight, hips extended, with his shoulders stacked over his hips, knees, and ankles. Many overuse injuries in the gym are caused by poor form over a long period of time. It’s rare that it’s a single awful deadlift. If it was, it’s more likely to be an acute injury (like a herniation) than an overuse injury. The simple explanation is this: deadlifting with a lousy lockout causes you to overdevelop your lower back (spinal erectors) while underdeveloping your glutes. The constant overdevelopment leads to the spinal erectors essentially taking over the role of the glutes: hip extension. Now that you’re using your lower back muscles instead of your glute muscles, you begin to move your spine incorrectly, possibly damaging the vertebrae and discs. As the lower back muscles overdevelop, they become stiff but also quite frequently sore, tense, and painful. In addition, the spine is meant to be kept perfectly still during a deadlift. Movement of the lumbar spine in either direction, flexion or extension, is not recommended. It’s been shown several times that movement of the lumbar spine when under load (say, deadlifting or squatting) can lead to spine injury. Perfect example of a hyperextended lockout that could be deceiving. Ribs are up and he’s leaning REALLY far back. This means that the lower back is hyperextended and in a compromised position. Again – the chest is too far out and the shoulders are behind the body. In the process, they arch their back hard at the top. Or, they lean back until the bar appears to be locked out. In both cases, they are not using their glutes. Remember, the glutes are large, powerful muscles that are responsible for generating force, speed, and power in their lower body. At the top, his head is no longer stacked over his shoulders, hips, and ankles. Simply put: He’s not standing up straight. The knees are shoved forward to the toes, rather than being under the hips. This means they’re bent, instead of extended. Tony does a great job even on this deadlift of not arching his back too far. Another version you’ll see if somebody straighten their knees, but arching their back by pushing their stomach forward. He’s standing up straight at the top, even with a tucked chin. Shoulders are stacked over hips, knees, and ankles. The knees finish straight and over the feet. If you watch his spine, it remains flat throughout the duration of the lift. There’s no movement. There’s a rattle at the top as the bar is locked out. It’s a much faster lift now that he’s using his glutes instead of his lower back. Better Cue: Pull UP on your knees. Why it’s a bad cue: Shoving the hips forward usually means lumbar hyperextension. Pulling up on your knees, like in a russian kettlebell swing, can help you to use your glutes. Alternative: Push the floor away from you. Bad Cue (for beginners): Squeeze your glutes at the top. Better Cue: Stand up without leaning back. Why it’s a bad cue: Squeezing your glutes is an internal cue. It’s something you do to or with your body. If you don’t know where or what your glutes are, it’s confusing. Many people will activate their erectors instead of their glutes when given this cue. Standing up is much easier to understand. As you become more experienced, use more internal cues like squeeze your glutes. Bad Cue: Brace your abs. Better Cue: Stiffen up like you’re about to be punched in the stomach. Why it’s a bad cue: Bracing the abs means different things to different people. Bad Cue: Arch your back. Better Cue: Show me your t-shirt. This creates the chest up, ribs down position that we want throughout the deadlift. Keeping the ribs down prevents the lower back from arching. To teach this, I recommend mastering Back to Wall Shoulder Raises as part of a warm up or daily mobility practice. That’s it for today. I explained the difference between a good and a bad lockout, explained why bad lockouts are risky, and gave examples of each. For Part 2 of this article, I’m going to introduce several of the exercises that you can use to improve your lockout, strengthen your glutes, and finally fix your deadlift technique. I’ll include a sample warmup, daily mobility routine, and core exercises to improve your lockout, posture, and glute strength. Subscribe to my newsletter by clicking here to make sure that you don’t miss part 2. If you’re unsure about your deadlift and live in the Franklin area, come show me! I’m more than happy to take a look at your deadlift and give you some pointers.